After the five hour story, I’ve just about got carpal tunnel from the sheer volume of frantic jumping and sliding I’ve done in Super Cloudbuilt. This new title from Coilworks and Double Eleven is a remake of the original ‘Cloudbuilt’, which dropped in 2014 exclusively for PC. 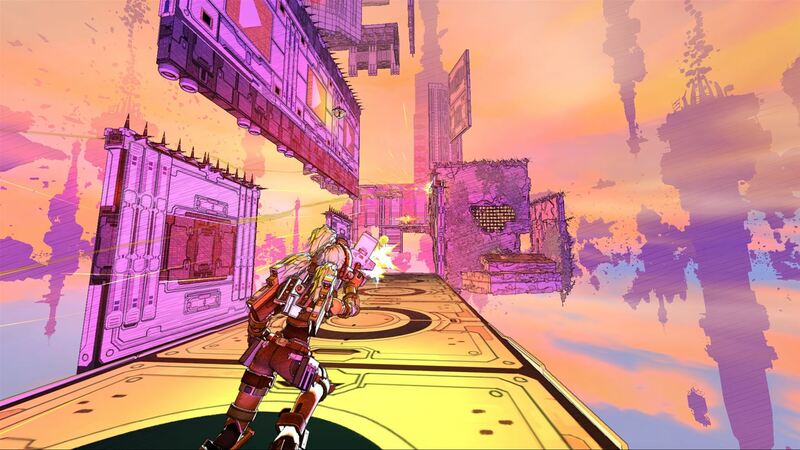 Super Cloudbuilt brings all the pain, joy and frustration of the self-proclaimed ‘parkour platformer’ to console. The game places players in the shoes of Demi, an injured yet dedicated soldier. You awaken into a decrepit building and spend the first few minutes jumping over, between and through various obstacles. After these first few tests you find yourself on the edge of a building in the sky – introducing the titular theme of clouds – and you’ll be presented with the thruster pack, which allows Demi to run faster, jump higher and wall-run further. You then make your way to a hospital sort-of building, which serves as your base of operations – from it you can select levels and rejuvenate health. And here, it quickly becomes apparent that this is a sort of dream world constructed by Demi’s subconscious, where each level represents a hurdle she must conquer in order to understand and overcome her injury. The story is pretty uneventful. Demi’s constant monologue provides the only real basis for the narrative. And sadly, she’s far from a compelling narrator. Her emotions chop and change from curious to anxious and there’s never anything prompting these fluctuations. So Demi’s story doesn’t elicit sympathy so much as it elicits confusion or even frustration. The main issue with Super Cloudbuilt as a story experience is that the narrative isn’t really linked with the gameplay. While each level has a funky name – like Fear or Inspiration – there’s nothing in the level that conveys the story. It’s not compelling to begin with and the endings are anticlimactic. At best, the narrative feels like an audio track combined with levels that vaguely reflect the theme. Visually, however, the game is breathtaking. Players can choose from a number of graphical options: painted, vibrant and colour pencil to name a few. There’s no real significance to the choice; but this level of customisation is always fun, and it’s a type of fun that isn’t offered by many games these days. Regardless of the graphical choice, levels weave together in awesome arrays of colour. Each level stacks onto itself, and you progress upwards through the gorgeous, yet dangerous, worlds navigating fluorescent lasers and flashing enemies. It’s a viscous yet captivating display of colour. And I’ve got to admit that about half of my total deaths occurred because I was so transfixed by the game’s design that I totally forgot what I was doing. As stellar as that compliment may be, it does, of course, beg the question about the other half of my deaths? They, unfortunately, came from random difficulty spikes. See, while the vertical cloud covered worlds are beautiful, they throw challenges through sporadic difficulty spikes. After you complete a fairly barebones tutorial, you’re thrust headfirst into the game. And there’s no real feeling of learning as you progress. Parts of the early levels were just as hard, if not harder, than the final levels. And while later levels introduce new challenges (such as zones where the thruster pack cannot be used), these challenges progress similarly – that is to say with volatile difficulty. This idea of difficulty progression is integral to platformers – it’s what makes them fun. You learn to embrace difficulty by way of an escalating challenge. 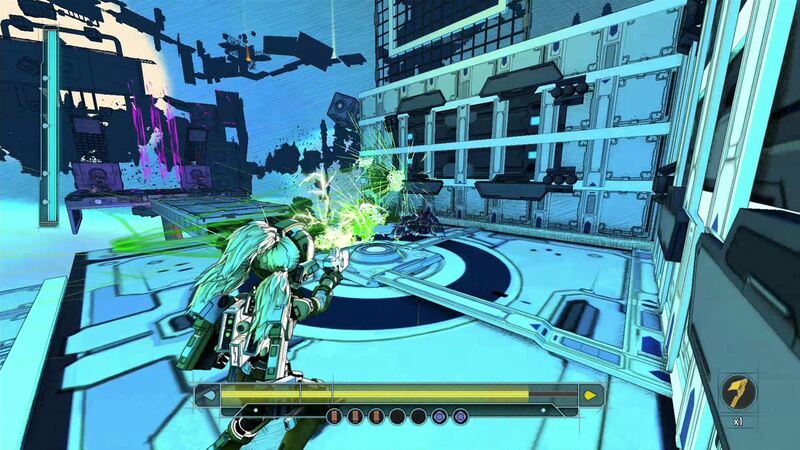 Super Cloudbuilt ignores this, and instead just throws levels at you willy-nilly. It doesn’t teach you to drive; it just straps some blocks to your feet and puts you in the car even though you’re viciously unprepared. Then it yells ‘don’t forget the checkpoints’ as you thunder off down the wrong side of the road. But, the checkpoint system isn’t any better. Checkpoints are placed throughout levels without reason or rhyme: one particularly lengthy level had three checkpoints, while another shorter level featured six. The player does have the ability to place their own checkpoints, but only if they’ve collected certain power-ups. You’re also limited to a measly amount of do-overs, and when you’re out, you’ll have to totally restart the level. And there’s nothing quite as infuriating as redoing a difficult section when you’d already beaten it and placed a checkpoint six deaths prior. Edit: As a commenter has pointed out, I was mistaken in counting these checkpoints. And I apologise for this factual inaccuracy. I meant that checkpoints were placed in peculiar locations. Perhaps that’s to force you into using deployable checkpoints (you start each level with one, and can collect more through exploration). However, the idea of detouring to collect these deployable checkpoints seems counterintuitive. On the whole, I feel that Super Cloudbuilt could well have profited from more strategically placed stock checkpoints. 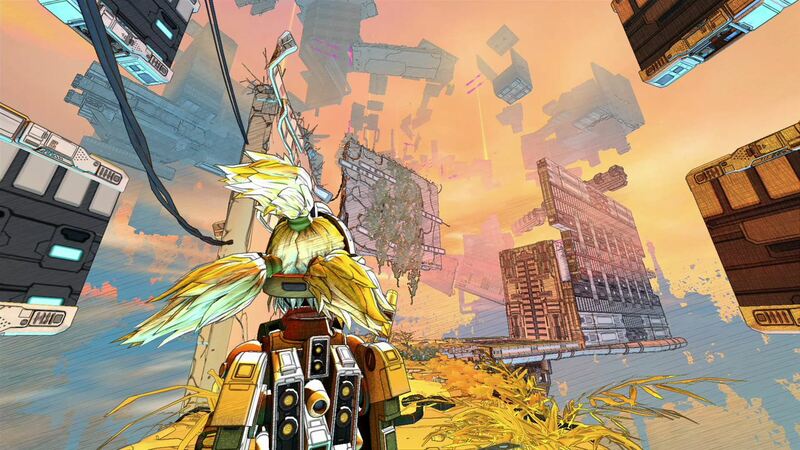 But Super Cloudbuilt revolves primarily around fast paced platforming and inventive mechanics. And luckily those mechanics are tight. Shooting works well, but the homing bullets remove aim from the equation and after a while it’s just a bit boring. Most of the time I was creatively jumping around enemies rather than shooting them, and that’s just because shooting feels cheap. The jumping, sliding and wall running work almost flawlessly. Moreover, employing combinations thereof allow you to tackle each level in your own way. More often than not you’ll find a way around a difficult path, but it often involves embracing another form of movement. This is an interesting approach and it’s one that gives the game a distinct element of longevity. At times the camera control can become a chore but that’s only when you’ve slowed down. See, the game is meant to be played at a lightning fast pace. The fact that you’ll have to wrestle the camera if you’re crawling through a level just means that you’re playing it wrong. When you’re jumping over robots and running on walls, Super Cloudbuilt is at its best. But these moments are broken up by poorly sequenced levels, a faulty checkpoint system and an arduous story. When everything comes together Super Cloudbuilt feels effortless; it’s smooth and gorgeous fun. It’s just a shame that those special moments aren’t more common. Next articleAre the free Xbox Games With Gold titles for August 2017 any good?